Proudly serving the larger community since 1934, North Shore Vacuum and Appliance now carries a full line of Miele vacuum cleaners Beverly MA area residents will treasure for years to come. 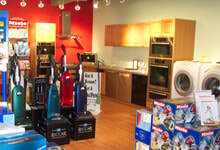 Miele vacuum cleaners are among the leading vacuum cleaners on the market. They are less expensive than other top names, but built to last. As the leading seller of Miele vacuum cleaners, Beverly MA area residents can trust us to provide for all your accompanying needs. We have everything from Miele vacuum cleaners, to replacement parts and hoses, as well as a full line of other Miele appliances, which are top-of-the-line quality and fully stocked for your needs. North Shore Vacuum and Appliance is a proud seller of Miele vacuum cleaners, and recognized as a product expert by the company. If you live in or around Beverly, North Shore Vacuum and Appliance will provide you free shipping on most orders over $59. Shop with us for Miele vacuum cleaners and other appliances and accessories to receive the discount. To learn more about Miele vacuum cleaners Beverly MA residents should contact our shop at (978) 774-1155, or stop in to see us today.